The police in Italy have a lot to contend with. Generally speaking, cars like the Fiat 500 isn’t much of a problem, but it’s the likes of those from Lamborghini, Ferrari, and even that little ol’ company called Pagani that gives the police a little more trouble. 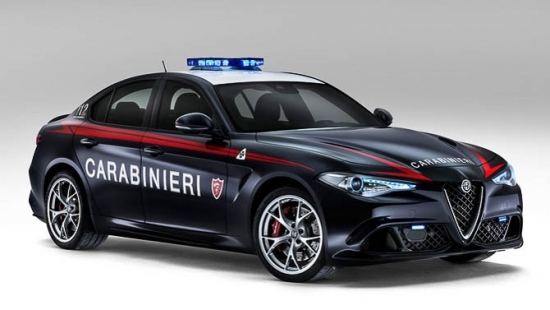 Well fear no more, it looks like the Italian military’s police just got their hands on a fleet of Giulia Quadrifoglio. For those who aren’t familiar with what this is, here are some quick performance specs. A 2.9-liter twin-turbo V6 is packed into the engine bay. That said engine pumps out 505 hp and 443 lb/ft of torque. Add on some official decals and a LED light bar and the Giulia Quadrifoglio is ready for duty. However, as capable as it is to chase down supercars, the car has been assigned to official high speed jobs only, such as driving around VIPs and dignitaries. Been meaning to post this video up on the blog for awhile now but keep forgetting. It is a pretty interesting video that focuses on how Governments set speed limits artificially low so they can write more tickets. 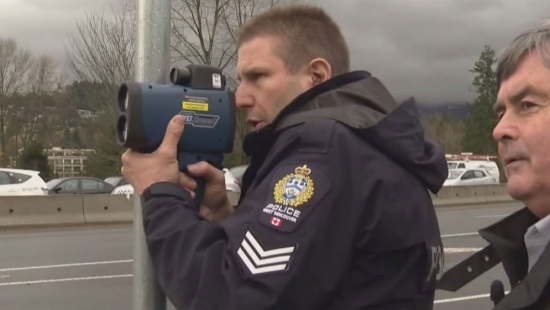 It looks at how ICBC, the Vancouver Police Department and the media all have a hand at shaping or distorting the truth when it comes to speeding. Calgary Police say that over the next six months you may see a number of police vehicles from the United States on some Calgary roads as part of a production filming for the new TV series Fargo. Filming will take place in and around the Calgary area (I’m guessing anywhere there are snowy roads) and will continue at least until May 2014. 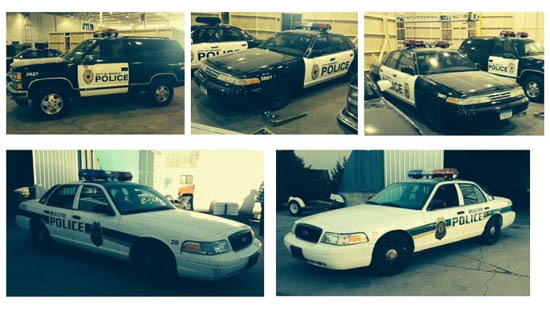 As part of the filming, the production company will be using a variety of different marked police vehicles made to look as if they are from the City of Bemidji Police and Duluth Police. While driving on City of Calgary roads there will be covers placed over the light bars. Calgary Police want the public to know they are aware of the production, who are working in co-operation with the Calgary Economic Development Film Office. If you’ve ever seen Fargo the movie and thought, gee this looks a lot like Calgary in winter, you’re probably not alone as the production crew seem to agree. While inaccurate directions provided by Apple Maps has been a mere inconvenience for some people, police from the Australian town of Mildura are warning the public to not rely on directions from Apple Maps as it may lead them dangerously astray. 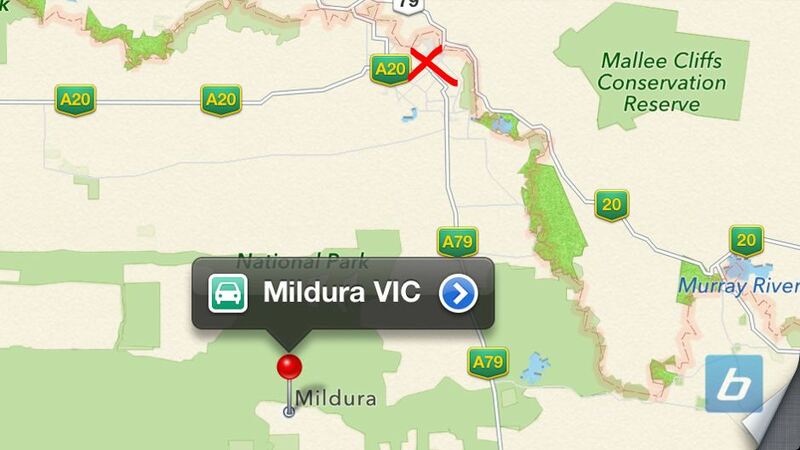 Instead of pointing users to the town of Mildura, Apple Maps incorrectly shows the town in the middle of the outback and combined with scorching summer heat of up to 46C several rescues have already been carried out from wayward travellers. The area of the National Park that users of Apple Maps are directed to is in a weak cell phone reception area escalating the danger. With no shelter from the sun or water, travellers would have to hike in the heat in rugged terrain to call for help. According to Mildura police, some of those rescued were stranded for more than 24 hours without any water. They have also contacted Apple in regards to this serious matter but as of right now it still has not been corrected. Mildura is still being shown as being in the middle of the National Park more than 70km from where it actually is up just off A20 as marked by the red X in the image above. Poor Apple, with Siri Eyes Free helping to make driving safer they suffer this setback putting iPhone users in danger. They’ve always strived for it, but this isn’t exactly the killer app they had wished for. A 19-year-old Ottawa man has been charged with a slew of offences after Tuesday afternoon’s police chase and crash on Highway 417 that closed the highway for nearly nine hours. Do you find it odd that our mail couriers, fire fighters, EMTs, and hell, even ice cream vendors all have purpose built vehicles but the brave men and women on the front line of law enforcement drive around (and pursue suspects) in vehicles that you and I could purchase? Look at any of the latest police cruisers in your city and chances are they are a Ford or GM built vehicle with police decals and a lightbar. Some have some upgrades designed strictly for law enforcement use but they are usually nothing more than run flat tires, steel rims, and better brakes. Carbon Motors thought it was not right either and set out to build a police patrol vehicle from the ground up. No more attaching light bars to passenger vehicles and slapping on police decals. The E7 is built by law enforcement for law enforcement. Powered by a 3.0L turbo diesel that cranks out over 420 ft-lb of torque and 350 hp, the 4000lb E7 is still capable of accelerating from 0-60mph in just 6.5s. It can do the 1/4 mile in [email protected] The beast rocks 14″ rotors up front and 13″ rotors in the rear. The most amazing spec however, is the fuel economy. At 28-30mpg, the E7 has about the same fuel economy as a Honda Civic. Officers at a recent Police Trade Show commented on many of its design features that don’t show up on spec sheets. The integrated emergency lights all over the vehicle ensure that the vehicle is easily seen even in bright daylight. The rear passenger compartment is completely isolated from the rest of the vehicle to further enhance officer safety. The seats are custom designed to accomodate a fully equipped officer (gun and all). By providing the extra seat room, not only is an officer more comfortable but he or she can easily access their weapon if necessary. The electronics in the vehicle are also state of the art with license plate tracking cameras, infrared camera, voice operated controls, dual search lights with joystick controls, lo-jack, and even a button with a radiation icon. I wonder what that does. Police officers have always been lacking a key tool to do their jobs, and finally a company has created a patrol vehicle designed from the ground up for law enforcement use. “I want to see the radar reading!” This was always a signal to me that the traffic stop was going to be a difficult one. The demand for a print out of the radar reading was a similar request. Depending on the tone of voice, it was often simpler to refuse outright and explain later on in traffic court, letting the justice be the referee. 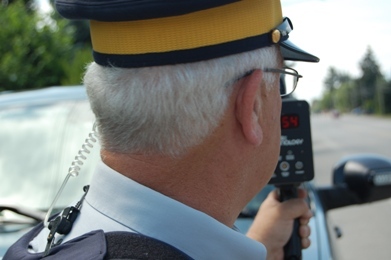 In British Columbia, the police are not required to show radar or laser readings to the alleged offender. Further, I have never used a radar or laser that created any sort of printout to hand to the person receiving the ticket. Failing to do either one will not make any difference to the case in traffic court. When the request was a polite one, I would show the readout of the device and explain it. Often I would also detail how the unit was tested for accuracy and then do the tests on the spot. In the case of a tripod mounted laser I would occasionally allow the driver an opportunity to use it themselves. This probably reduced the chance of a dispute because the person understood how their vehicle’s speed had been measured. It always seemed that I either had not locked in a violator speed or had locked in a following vehicle’s speed when the tone was belligerent. No amount of explanation would satisfy the person that I couldn’t recall their speed after they had passed by and I had measured the vehicle behind them. The sight of a blank display virtually guaranteed a dispute. Rather than suffer prolonged verbal abuse, I would refuse and wait for court. For evidence to the contrary, your own speedometer will be the source of the reading that is important to your defence. Testing to make sure that your speedometer is accurate immediately following the receipt of a speeding ticket will reinforce the importance of that reading. It will also help you determine the accuracy of the officer’s measurement. Ryan Moats, a running back for the Houston Texans was doing what every other normal person would do after hearing news that their mother-in-law was dying at the hospital. He got into his vehicle with his wife and rushed to the hospital so they could say their last goodbyes before she passed away. Unfortunately, a over-zealous traffic officer who had an obvious lapse of judgement denied Moats the opportunity to do so as he finished with his traffic stop. Officer Robert Powell of the Dallas Police Department had attempted to pull Moats over for speeding and running a red light. 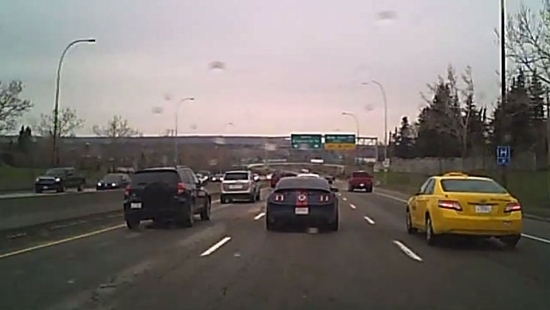 Instead of pulling over, Moats activated his hazard lights and continued towards the hospital. After pulling into a parking spot in the hospital parking lot, Moats and his wife exited his vehicle and proceeded to enter the hospital when officer Powell drew his gun and asked them to stay put. After finally writing the tickets for speeding and running the red light, officer Powell continues to lecture Moats for his attitude and tells him that next time he should stop and explain to the officer what is going on. Its too bad that Officer Powell doesn’t understand that there IS NO NEXT TIME. You can watch the following videos to see how it all unfolded. We received an e-mail earlier this week from a chap named Gord Moors. He introduced himself as the owner of Varsity Chrysler and AutoMaxx Calgary. Regular readers of beyond would instantly recognize the name as there have been a few reviews written about those dealerships and a sales person by the name of Chris Thin. Anyway, Gord explains in subsequent e-mails that certain members on the forums are posting threats of violence towards Chris Thin. Our moderators removed those posts as soon as they were discovered (this thread is 4 years old!) but Gordy still wasn’t happy with how we dealt with it. For the full e-mail correspondence, check out the forum thread. We (the public) often criticize law enforcement for using deadly force in situations that we feel do not warrant it. Here is a thread with a few scenarios for you to read and decide if you would shoot if you were a police officer. There are no right/wrong answers to the scenarios, but its interesting to see the different responses. The blue recycling carts are gradually being delivered to more residents in the city and has sparked another recycling debate. Its too bad the city did not allow homeowners to opt out of the recycling program but most seem to be in favor of the program. I find it odd that the recycling fee is mandatory when the city will still be operating the community recycling centers (after they convert it to accept the same materials as the blue carts). Most condo/apartment complexes already have their own recycling programs so who will be using the community recycling centers?